Ebola virus disease (EVD) is a complex zoonosis that is highly virulent in humans. The largest recorded outbreak of EVD is ongoing in West Africa, outside of its previously reported and predicted niche. We assembled location data on all recorded zoonotic transmission to humans and Ebola virus infection in bats and primates (1976–2014). 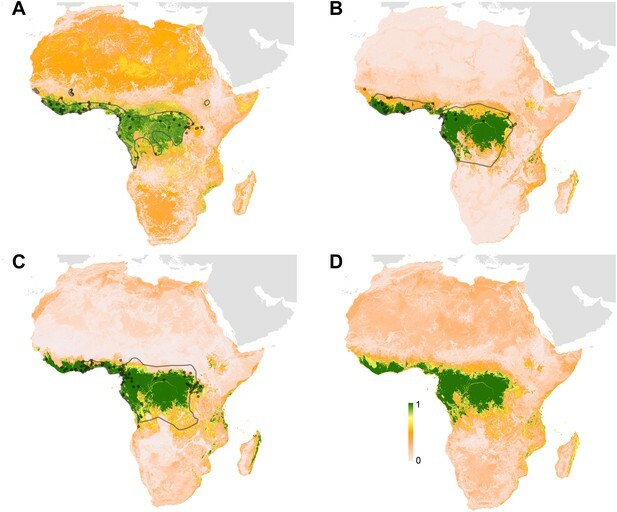 Using species distribution models, these occurrence data were paired with environmental covariates to predict a zoonotic transmission niche covering 22 countries across Central and West Africa. Vegetation, elevation, temperature, evapotranspiration, and suspected reservoir bat distributions define this relationship. At-risk areas are inhabited by 22 million people; however, the rarity of human outbreaks emphasises the very low probability of transmission to humans. Increasing population sizes and international connectivity by air since the first detection of EVD in 1976 suggest that the dynamics of human-to-human secondary transmission in contemporary outbreaks will be very different to those of the past. Since the first outbreaks of Ebola virus disease in 1976, there have been numerous other outbreaks in humans across Africa with fatality rates ranging from 50% to 90%. Humans can become infected with the Ebola virus after direct contact with blood or bodily fluids from an infected person or animal. The virus also infects and kills other primates—such as chimpanzees or gorillas—though Old World fruit bats are suspected to be the most likely carriers of the virus in the wild. The largest recorded outbreak of Ebola virus disease is ongoing in West Africa: more people have been infected in this current outbreak than in all previous outbreaks combined. The current outbreak is also the first to occur in West Africa—which is outside the previously known range of the Ebola virus. Pigott et al. have now updated predictions about where in Africa wild animals may harbour the virus and where the transmission of the virus from these animals to humans is possible. As such, the map identifies the regions that are most at risk of a future Ebola outbreak. The data behind these new maps include the locations of all recorded primary cases of Ebola in human populations—the ‘index’ cases—many of which have been linked to animal sources. The data also include the locations of recorded cases of Ebola virus infections in wild bats and primates from the last forty years. The maps, which were modelled using more flexible methods than previous predictions, also include new information—collected using satellites—about environmental factors and new predictions of the range of wild fruit bats. Pigott et al. report that the transmission of Ebola virus from animals to humans is possible in 22 countries across Central and West Africa—and that 22 million people live in the areas at risk. However, outbreaks in human populations are rare and the likelihood of a human getting the disease from an infected animal still remains very low. The updated map does not include data about how infections spread from one person to another, so the next challenge is to use existing data on human-to-human transmission to better understand the likely size and extent of current and future outbreaks. As more people live in, and travel to and from, the at-risk regions than ever before, Pigott et al. note that new outbreaks of Ebola virus disease are likely to be very different to those of the past. Ebola viruses have for the last forty years been responsible for a number of outbreaks of Ebola virus disease (EVD) in humans (Pattyn et al., 1977), with high case fatality rates typically around 60–70%, but potentially reaching as high as 90% (Feldmann and Geisbert, 2011). The most recent outbreak began in Guinea in December 2013 (Baize et al., 2014; Bausch and Schwarz, 2014) and has subsequently spread to Liberia, Sierra Leone and Nigeria (ECDC, 2014). The unprecedented size and scale of this ongoing outbreak has the potential to destabilise already fragile economies and healthcare systems (Fauci, 2014), and fears of international spread of a Category A Priority Pathogen (NIH, 2014) have made this a massive focus for international public health (Chan, 2014). This has led to the current outbreak being declared a Public Health Emergency of International Concern on the 8 August 2014 (Briand et al., 2014; Gostin et al., 2014; WHO, 2014d). The Filoviridae, of which Ebolavirus is a constituent genus, belong to the order Mononegavirales. Two other genera complete the family: Marburgvirus, itself responsible for a number of outbreaks of haemorrhagic fever across Africa (Gear et al., 1975; Conrad et al., 1978; Smith et al., 1982; Towner et al., 2006) and Cuevavirus, recently isolated from bats in northern Spain (Negredo et al., 2011). Five species of Ebolavirus have been isolated to date (Kuhn et al., 2010; King et al., 2012); the earliest recognised outbreaks of EVD were reported in Zaire (now the Democratic Republic of the Congo [DRC]) and Sudan in 1976 (International Commission, 1978; WHO International Study Team, 1978). The causative viruses were isolated (Pattyn et al., 1977) and later identified to be distinct species, Zaire ebolavirus (EBOV) and Sudan ebolavirus (SUDV). A third species of Ebolavirus, Reston ebolavirus, was isolated from Cynomologus monkeys imported from the Philippines to a facility in the United States, where they experienced severe haemorrhaging (Jahrling et al., 1990). Whilst serological evidence of infection with this species has been reported in individuals in the Philippines (Miranda et al., 1991), no pathogenicity has been reported beyond primates and porcids (Barrette et al., 2009; Feldmann and Geisbert, 2011). In 1994 a fourth species, Tai Forest ebolavirus was isolated from a veterinarian who had autopsied a chimpanzee in Côte d’Ivoire (Le Guenno et al., 1995), though the virus has not been detected subsequently. The final species, Bundibugyo ebolavirus, was responsible for an outbreak of EVD in Uganda in 2007 (Towner et al., 2008), as well as a more recent outbreak in the DRC (WHO, 2012b). Initial analysis suggested that the viruses isolated from the current outbreak, originating in Guinea, formed a separate clade within the five Ebolavirus species (Baize et al., 2014). Subsequent re-analysis of the same sequences however, indicated that these isolates instead nest within the Zaire ebolavirus lineage (Dudas and Rambaut, 2014), and diverged from Central Africa strains approximately ten years ago (Gire et al., 2014). Which reservoir species are responsible for maintaining Ebola transmission between outbreaks is not well understood (Peterson et al., 2004b), but over the last decade significant progress has been made in narrowing down the list of likely hosts (Peterson et al., 2007) (Figure 1). Primates have long been known to harbour filoviral infections, with the first Marburg strains identified in African green monkeys in 1967 (Siegert et al., 1967; Beer et al., 1999). Significant mortality has also been reported in wild primate populations across Africa, most notably in gorilla (Gorilla gorilla) and chimpanzee (Pan troglodytes) populations (Formenty et al., 1999; Rouquet et al., 2005; Bermejo et al., 2006). The high case fatality rates recorded in the great apes combined with their declining populations and limited geographical range, indicate they are likely dead-end hosts for the virus and not reservoir species (Groseth et al., 2007). A large survey of small mammals in and around Gabon identified three species of bats which were infected with Ebola viruses—Hypsignathus monstrosus, Epomops franqueti and Myonycetris torquata (Leroy et al., 2005). Subsequent serological surveys (Pourrut et al., 2009; Hayman et al., 2010) and evidence linking the potential source of human outbreaks to bats (Leroy et al., 2009) lend support to the hypothesis of a bat reservoir. This, coupled with repeated detection of Marburgvirus in the fruit bat Rousettus aegypticus (Towner et al., 2009) and the only isolations of Cuevavirus also from bats (specifically Llovia virus [Negredo et al., 2011]), all support the suspicion that Chiroptera play an important role in the natural life-cycle of the filoviruses. The epidemiology of Ebola virus transmission in Africa. Of the suspected reservoir species, 1, 2 and 3 represent the three bat species from which Ebola virus has been isolated (Hypsignathus monstrosus, Myonycteris torquata and Epomops franqueti) and n represents unknown reservoirs of the disease yet to be discovered. Of the susceptible species, A represents Pan troglodytes, B Gorilla gorilla and m represents other organisms susceptible to the disease, such as duikers. H represents humans. Blue arrows indicate unknown transmission cycles or infection routes and red arrow routes have been confirmed or are suspected. Adapted from Groseth et al. (2007). 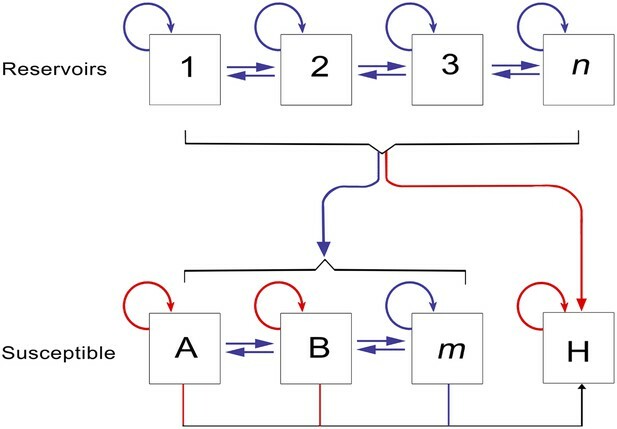 Humans represent a dead-end host for the virus, with only stuttering chains of transmission reported between humans in the majority of previous outbreaks (Chowell et al., 2004; Legrand et al., 2007) and no indication that humans can reintroduce the virus back into reservoir species (Karesh et al., 2012). The incubation period in humans ranges from two days to three weeks, after which a variety of clinical symptoms arise, affecting multiple organs of the body. At the peak of illness, haemorrhaging shock and widespread tissue damage can occur and can eventually lead to death within 6–16 days (Feldmann and Geisbert, 2011). Human-to-human transmission is mainly through direct unprotected contact with infected individuals and cadavers, with infectious particles detected in a number of different body fluids (Feldmann and Geisbert, 2011). The typical outbreak profile is defined by an index individual that has recently come into contact with the blood of another mammal through either hunting or the butchering of animal carcasses (Pourrut et al., 2005). Whilst it has been difficult to identify the zoonotic source for the index cases of some outbreaks, a recurring theme of hunting and handling bushmeat is suspected (Table 1; Boumandouki et al., 2005; Nkoghe et al., 2005, 2011; Leroy et al., 2009). For some outbreaks, including the most recent, the initial source of zoonotic transmission has not been identified. In subsequent human-to-human transmission, the highest risk activities are those that bring humans into close contact with infected individuals. These include medical settings where insufficient infection control precautions have been taken, as well as home care and funeral preparations carried out by families or close friends (Baron et al., 1983; Georges et al., 1999; Boumandouki et al., 2005). As the conditions required for transmission are culturally and contextually dependent, opportunities for sustained transmission are highly heterogeneously distributed. Typically, chains of infection do not exceed three or four sequential transmission events, although occasionally (and particularly in the early stages of infection) a single individual may be responsible for directly infecting a large number of others (Brady et al., 2014). In the outbreak in Gabon in 1996, a single person was responsible for infecting ten other individuals (Milleliri et al., 2004) whilst in the 1995 outbreak in the DRC, thirty five cases resulted from one individual (Khan et al., 1999). Secondary transmission can be restricted by effective case detection and isolation measures (Shoemaker et al., 2012; WHO, 2014c). Where this cannot be achieved, either due to a lack of infrastructure, poor understanding of the disease, or distrust of medical practices, secondary cases can continue to occur (Khan et al., 1999; Larkin, 2003; Hewlett et al., 2005). As the number of infections grows, the ability of healthcare systems to control the further spread diminishes and the risk of a large outbreak increases. DRC = Democratic Republic of the Congo, ROC = Republic of Congo. The recent outbreak in Guinea and surrounding countries indicate that the previous paradigm for Ebola outbreaks is shifting (Briand et al., 2014; Chan, 2014). The last 40 years of EVD outbreaks were accompanied by considerable changes in demographic patterns throughout Africa. There has been a large increase in population size coupled with increasing urbanisation (Cohen, 2004; Seto et al., 2012; Linard et al., 2013). African populations have also become better connected internally and internationally (Linard et al., 2012; Huang and Tatem, 2013). Only recently have we begun to understand the dynamic nature of these travel patterns (Garcia et al., 2014; Gonzalez et al., 2008; Simini et al., 2012; Wesolowski et al., 2013, 2012) which have been clearly demonstrated to influence disease transmission over different temporal and spatial scales (Hufnagel et al., 2004; Yang et al., 2008; Stoddard et al., 2009; Talbi et al., 2010; Brockmann and Helbing, 2013; Pindolia et al., 2014). Changes in land use and penetration into previously remote areas of rainforest bring humans into contact with potential new reservoirs (Daszak, 2000), while changes in human mobility and connectivity will likely have profound impacts on the dispersion of Ebola cases during outbreaks. These conditions are thought to have a major role in setting the stage for the current outbreak. This paper aims to define the areas suitable for zoonotic transmission of Ebolavirus (i.e., those routes defined in Figure 1 excluding human-to-human transmission) through species distribution modelling techniques. The fundamental niche of a species can be conceptualised as the confluence of environmental conditions that support its presence in a particular location (Franklin, 2009). Species distribution models quantitatively describe this niche based on known occurrence records of the organism and their associated environmental conditions, enabling predictions of the likely geographic distribution of the species in other regions (Elith and Leathwick, 2009). The era of satellites and geographical information systems has made high resolution global data on environmental conditions increasingly available (Hay et al., 2006; Weiss et al., 2014b). Species distribution modelling using flexible machine learning approaches have been successfully applied to map the global distributions of disease vectors (Sinka et al., 2012) and pathogens such as dengue (Bhatt et al., 2013), influenza (Gilbert et al., 2014) and leishmaniasis (Pigott et al., 2014). Previous studies applied the GARP (Genetic Algorithm for Rule-set Production) species distribution modelling approach (Stockwell and Peters, 1999) to the locations of 12 Ebola outbreaks in humans between 1976 and 2002 to map the likely distribution of Ebola viruses (Peterson et al., 2004a) and as a mechanism to identify potential reservoir hosts (Peterson et al., 2004b; Peterson et al., 2007). Here we update and improve the maps of the zoonotic transmission niche of EVD by: (i) incorporating more recent outbreak data from outside the formerly predicted niche of EVD; (ii) integrating for the first time data on outbreaks in primates and the occurrence of the virus in the suspected Old World fruit bat (OWFB) reservoirs; (iii) using new satellite-derived information on bespoke environmental covariates from Africa, including new distribution maps of the OWFB; and (iv) using new increasingly flexible niche mapping techniques in the modelling framework. To elucidate the relevance of these maps for transmission, we have also calculated the population at risk of primary spillover outbreaks from the zoonotic niche of EVD in Africa, and we investigated the changing nature of the populations within this niche. In total, 23 outbreaks of Ebola virus were identified in humans across Africa, consisting of a hypothesised 30 independent primary infection events (Table 1; Figure 2). These outbreaks span the last 40 years from the first outbreaks in 1976 to the five outbreaks that have occurred since 2010 (Table 1). The locations of the index cases span from West Africa, with the most westerly outbreak ongoing in Guinea, to Gabon, the Republic of Congo (ROC), the DRC, South Sudan and Uganda. Before December 2013, a total of 2322 cases had occurred from Ebolavirus infections, a number already overtaken by the likely underreported current case count of the ongoing outbreak >2250 (WHO, 2014a) (Figure 2A). Of the four viruses circulating in Africa, Zaire ebolavirus has been responsible for the most outbreaks (13), followed by Sudan ebolavirus (7) and Bundigbuyo ebolavirus with just two outbreaks in 2007/8 and 2012. Tai Forest has caused one confirmed infection in humans, from which the patient recovered (Le Guenno et al., 1995; Formenty et al., 1999). Although outbreaks have been reported since 1976, there was an absence of reported outbreaks in humans for 15 years between 1979 and 1994 (although antibodies in humans were identified over the period [Kuhn, 2008]) and the frequency of outbreaks has increased substantially post 2000 (Figure 2A). The locations of Ebola virus disease outbreaks in humans in Africa. (A) Illustrates the 23 reported outbreaks of Ebola virus disease through time, with the area of each circle and its position along the y-axis representing the number of cases. The onset year is represented by the colour as per (B). (B) Shows a map of the index cases for each of these outbreaks. (C–H) Show these outbreaks over a series of time periods. Numbers refer to outbreaks as listed in Table 1. In (B–H) the species of Ebola virus responsible for the outbreak is illustrated by the symbol shape, the number of resulting cases and onset date by symbol colour. The most recent outbreak (#23) is indicated in orange. Countries in which zoonotic transmission to humans has been reported or is assumed to have occurred are coloured in blue. In each map the Democratic Republic of Congo is outlined for reference. A total of 51 surveyed locations reporting infections in animals were identified in the literature since the discovery of the disease (Table 2; Figure 3). These comprised 17 infections in gorillas (Gorilla gorilla), nine infections in chimpanzees (Pan troglodytes), 18 in OWFB and 2 in duikers (Cephalophus spp.). A large proportion of the great ape cases originated from the ROC/Gabon border, coinciding with the main known distributions of both chimpanzees and gorillas (Petter and Desbordes, 2013) and representing a period of well-documented great ape Ebola outbreaks in and around the Lossi Animal Sanctuary (Rouquet et al., 2005; Bermejo et al., 2006; Walsh et al., 2009). All animal isolations of Ebola viruses have come from countries that have also reported index cases of human outbreaks, with the exception of several seropositive bats from a survey in southern Ghana. ROC = Republic of Congo. The locations of reported Ebola virus infection in animals in Africa. (A) Shows the locations of reported Ebola virus infection in animals. (B–D) Show these records in animals over three different time periods. Numbers refer to records as listed in Table 2. In all panels, the species in which infection was detected is given by symbol shape and the year recorded by symbol colour. Blue countries represent locations where zoonotic transmission to humans has been reported or is assumed to have occurred. In each map the Democratic Republic of Congo is outlined for reference. Three species of bats, Hypsignathus monstrosus, Myonycteris torquata and Epomops franqueti, were identified as the most likely candidates to be reservoir species for Ebola viruses due to high seroprevalence and the isolation of RNA closely related to Zaire ebolavirus (Leroy et al., 2005; Olival and Hayman, 2014). In total, 239 locations were identified from the Global Biodiversity Information Facility (GBIF) (GBIF, 2014): 67 for H. monstrosus (Figure 4A), 52 for M. torquata (Figure 4B) and 120 for E. franqueti (Figure 4C). Distribution models for all three species demonstrated predictive skill (indicated by an area under the curve (AUC) greater than 0.5) as follows: H. monstrosus AUC 0.63 ± 0.04; M. torquata AUC = 0.59 ± 0.04; E. franqueti AUC = 0.58 ± 0.03, n = 50 submodels for all three species. In addition, each species was broadly predicted within its considered expert opinion range (Figure 4A–C) (Schipper et al., 2008). The marginal effect plots (not shown) were strongly influenced by land surface temperature (LST) and vegetation (as measured by the enhanced vegetation index [EVI]). The predicted combined distribution of these species (Figure 4D), covers West and Central Africa, specifically the moist forests of the northeastern, western and central Congo basin, and Guinea, as well as the Congolian coastal forest ecoregions (WWF, 2014). Predicted geographical distribution of the three species of Megachiroptera suspected to reservoir Ebola virus. (A) Shows the distribution of the hammer-headed bat (Hypsignathus monstrosus), (B) The little collared fruit bat (Myonycteris torquata) and (C) Franquet's epauletted fruit bat (Epomops franqueti). In each map, the locations of reported observations of each species, extracted and curated from the Global Biodiversity Information Facility (GBIF, 2014) and used to train each model are given as grey points (H. monstrosus, n = 67; E. franqueti, n = 120 and M. torquata, n = 52). Expert opinion maps of the known range of each species, generated by the IUCN (Schipper et al., 2008), are outlined in grey. The colour legend represents a scale of the relative probability that the species occurs in that location from 0 (white, low) to 1 (green, high). Area under the curve statistics, calculated under a stringent ten-fold cross validation procedure, are 0.63 ± 0.04, 0.59 ± 0.04 and 0.58 ± 0.03 for H. monstrosus, M. torquata and E. franqueti respectively. (D) Is a composite distribution map giving the mean, relative probability of occurrence from (A–C). The predicted environmental niche for zoonotic transmission of EVD is shown in Figure 5. All countries with observed index cases of EVD (n = 7, hereafter Set 1) have areas of the highest environmental suitability (see list in Table 1). In addition, areas of high environmental suitability for zoonotic transmission are predicted in a further 15 countries where, to date, index cases of the four African species of Ebolavirus have not been recorded. These are Nigeria, Cameroon, Central African Republic (CAR), Ghana, Liberia, Sierra Leone, Angola, Tanzania, Togo, Ethiopia, Mozambique, Burundi, Equatorial Guinea, Madagascar and Malawi (hereafter Set 2). Predicted geographical distribution of the zoonotic niche for Ebola virus. (A) Shows the total populations living in areas of risk of zoonotic transmission for each at-risk country. The grey rectangle highlights countries in which index cases of Ebola virus disease have been reported (Set 1); the remainder are countries in which risk of zoonotic transmission is predicted, but in which index cases of Ebola have not been reported (Set 2). These countries are ranked by population at risk within each set. The population at risk Figure in 100,000 s is given above each bar. (B) Shows the predicted distribution of zoonotic Ebola virus. The scale reflects the relative probability that zoonotic transmission of Ebola virus could occur at these locations; areas closer to 1 (red) are more likely to harbour zoonotic transmission than those closer to 0 (blue). Countries with borders outlined are those which are predicted to contain at-risk areas for zoonotic transmission based on a thresholding approach (see ‘Materials and methods’). The area under the curve statistic, calculated under a stringent 10-fold cross-validation procedure is 0.85 ± 0.04. Solid lines represent Set 1 whilst dashed lines delimit Set 2. Areas covered by major lakes have been masked white. The AUC for the Ebola model was relatively high (AUC = 0.85 ± 0.04, n = 500 submodels) indicating that the model could strongly distinguish regions of environmental suitability for EVD. Enhanced vegetation index had the greatest impact on the distribution (relative contribution [RC] of 65.3%) followed by elevation (RC = 11.7%), night-time land surface temperature (LST) (RC = 7.7%), potential evapotranspiration (PET) (RC = 5.7%) and combined bat distribution (RC = 3.8%). Marginal effect plots are presented in Figure 5—figure supplement 2. In total, 22.2 million people are predicted to live in areas suitable for zoonotic transmission of Ebola. The vast majority, 21.7 million (approximately 97%), live in rural areas, as opposed to urban or peri-urban areas (CIESIN/IFPRI/WB/CIAT, 2007; WorldPop, 2014). Of these, 15.2 million are in Set 1 and 7 million are in Set 2. In terms of ranked populations at risk, DRC, Guinea and Uganda are highest in Set 1 and Nigeria, Cameroon and CAR are top in Set 2. For a full listing of these populations living in areas of risk, see the stacked bar plot in Figure 5A. Over the 40 year period since discovery of EVD, the total population living in those countries predicted to be within the zoonotic niche has nearly tripled (from 230 million to 639 million) and the proportion of the population in these countries living in an urban (rather than rural) setting has changed from 25.5% to 59.2% (Figure 6). Changes in national population for countries predicted to contain areas at-risk of zoonotic Ebola virus transmission. For each country the population (in millions) is presented for three time periods (1976, 2000 and 2014) as three bars. Each stacked bar gives the rural (green) and urban (blue) populations of the country. The grey rectangle highlights countries in which index cases of Ebola virus diseases have been reported (Set 1); the remainder are countries in which risk of zoonotic transmission is predicted, but where index cases have not been reported (Set 2). The fractional change in population between 1976 and 2014 is given above each set of bars. Data on the connectivity of human populations over this period were not available. We can infer however, intuitively, empirically and theoretically (Zipf, 1946; Simini et al., 2012) that rates of population movement within a country will scale directly in proportion to population growth. Records of passenger seat capacity are available since 2000 and show substantive increases over the period in Set 1 (from 2.96 to 4.77 million, a fractional change of 1.61) and Set 2 (from 5.6 to 15.6 million, a change of 2.8) (Figure 7A). More specific data on passenger volumes show almost universally similar increases since 2005 with Set 1 nations changing from 2 million to 2.5 million, a fractional change of 1.22 and Set 2 changing from 5 million to 7.9 million, a change of 1.57 (Figure 7B). Changes in international flight capacity and traveller volumes for countries predicted to contain areas at-risk of zoonotic Ebola virus transmission. The grey rectangle highlights countries in which index cases of EVD have been reported (Set 1). The remainder are countries in which risk of zoonotic transmission is predicted, but where index cases have not been reported (Set 2). (A) Shows changes in annual outbound international seat capacity (between 2000 in red and 2013 in blue). (B) Depicts changes in annual outbound international passenger volume by country (between 2005 in red and 2012 in blue). For each country, the fractional change in volume is given above each set of bars. Note that only one bar is presented for South Sudan as data for this region prior to formation of the country in 2011 were unavailable. Global analysis of airline passenger volumes demonstrates that international connectivity has increased amongst all global regions and national income strata (Figure 8). Total passenger volumes have increased by a third from 9.5 to over 14 million during the eight year window (2005–2012) where records are available. The largest increases have occurred in WHO regions (WHO, 2014b) outside of the sub-Saharan African region (AFRO) (Figure 8A,B). In 2012, almost half of the final destinations of those travelling from these at-risk countries were to other AFRO nations (47%). Other frequent destinations were in Europe (EURO; 27%) and the Eastern Mediterranean (EMRO; 13%). 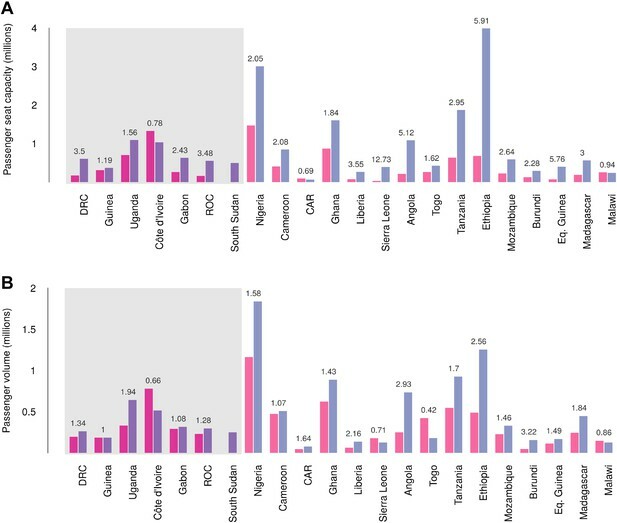 Similarly, analysis of passenger volumes by World Bank national income groupings (WHO, 2014b) (Figure 8C,D) show that in 2012 40% of all passenger final destinations were to low or low-middle income countries. Numbers of airline passengers arriving from at-risk countries to other countries stratified by major geographic regions and national income groups. (A) Shows the locations of WHO regions (AFRO–African Region; AMRO–Region of the Americas; EMRO–Eastern Mediterranean Region; EURO–European Region; SEARO–South-East Asian Region; WPRO–Western Pacific Region). (B) Displays the numbers of passengers arriving in each of these regions from countries predicted to contain areas at risk of zoonotic Ebola virus transmission (Sets 1 and 2) in 2005 and 2012. (C) Shows the income tiers of all countries as defined by the World Bank. (D) Displays the total numbers of passengers arriving in countries in each of these income strata from at-risk countries in 2005 and 2012. The number above each pair of bars indicates the fractional change in these numbers of incoming passengers between 2005 and 2012. We have re-evaluated the zoonotic niche for EVD in Africa. In doing so we have (i) used all existing outbreaks to assemble an inventory of index cases (n = 30); (ii) added to this all confirmed records of Ebola virus in animals (n = 51); (iii) assembled more accurate and contemporary environmental covariates including new maps of the distribution of confirmed OWFB reservoirs of the disease; and (iv) used the latest niche modelling techniques to predict the geographic distribution of potential zoonotic transmission of the disease. Using these predictions we have estimated the populations at risk of EVD both in countries which have confirmed index cases (Set 1, n = 7) and those for which we predict strong environmental suitability for outbreaks (Set 2, n = 15). In all countries at risk we show that since the discovery of EVD in 1976, urban and rural populations have increased and have become more interconnected both within and across national borders. During the last 40 years the increasing size and connectivity of these populations may have facilitated the subsequent spread of EVD outbreaks. These factors underline a change in the way in which EVD interacts with human populations. The remote and isolated nature of Ebola zoonotic transmission events, paired with the relatively poor diagnostics and understanding of the disease transmission routes in early outbreaks, mean that under-reporting of previous outbreaks is probable. An increasing understanding and description of a broader range of symptoms used in case definitions of EVD (Leroy et al., 2000; Feldmann and Geisbert, 2011) also increase the possibility that past outbreaks may have been misattributed to different diseases (Tignor et al., 1993). This poor detectability of EVD also clearly limits capacity to accurately identify the locations and transmission routes of index cases (Heymann et al., 1980; Baize et al., 2014). We must assume, as has been done previously (Peterson et al., 2004a; Jones et al., 2008), that the first reported cases are representative of the true location of the index cases. Where possible we have represented this geographic uncertainty by attributing the index case to a wide-area polygon which then incorporated this uncertainty into the mapping process (see ‘Materials and methods’). The relationship between the EVD niche and the environmental covariates (Figure 5—figure supplement 2), particularly the high relative contribution of the vegetation index, underscore that there are clear environmental limits to transmission of the virus from animals to humans, and that ecoregions dominated by rainforest are the primary home of such zoonotic cycles. Our analysis has shown that the zoonotic niche of the pathogen is more widespread than previously predicted or appreciated (Peterson et al., 2004a), most notably in West Africa. This analysis used information from all human outbreaks and animal infections to delineate the likely zoonotic niche of the disease. Further analysis, excluding the existing outbreak focussed in Guinea from the dataset used to train the model (Figure 5—figure supplement 3), still resulted in prediction of high suitability in this region, with the presumed index village located within 5 km of an at-risk pixel. This implies that the eco-epidemiological situation in Guinea is very similar to that in past outbreaks, mirroring phylogenetic similarity in the causative viruses (Dudas and Rambaut, 2014; Gire et al., 2014). The ecological similarity between the past and current outbreaks also lends support to the notion that the scale of this outbreak is more heavily influenced by patterns of human-to-human transmission than any expansion of the zoonotic niche. It is important to appreciate that this zoonotic niche map delineates areas in which populations are at-risk of zoonotic transmission of EVD (Figure 5B). It does not predict the likelihood of EVD spillover, the likelihood of an outbreak establishing, or its subsequent rate of spread within a population. Increasing human encroachment and certain cultural practices sometimes linked with poverty, such as bushmeat hunting, result in increasing exposure of humans to animals which may harbour diseases including Ebola (Daszak, 2000; Wolfe et al., 2005, 2007). Increasing human population may accelerate the degree of risk through these processes but spatially refined information on these factors is not available comprehensively. It is hoped that as the understanding of the risk factors for zoonotic transmission of Ebolavirus to humans increases, it will be possible to incorporate this information into future risk mapping assessments. Previous considerations of the geographic distribution of EVD have used human outbreaks alone. We have updated this work to include the last decade of outbreaks, as well as disaggregated outbreaks where evidence suggests multiple independent zoonotic transmission events overlap in space and time. Furthermore, our modelling process accommodates uncertainty in geopositioning of these index cases by utilising both point and polygon data. In addition, we include occurrence of infection in wildlife, important to the wider scale of zoonotic transmission (Figure 1), which in total has increased the dataset used in the model to 81 occurrences. 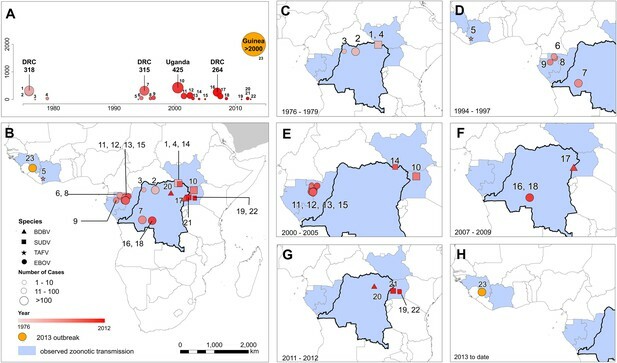 The rareness of EVD outbreaks and the prevalence of detectable Ebola virus in reservoir species suggests that there will always be a limited set of observation data when compared to mapping of more prevalent zoonoses (Pigott et al., 2014). The results demonstrate predictive skill using a stringent validation procedure, however, indicating strong model performance even with this relatively limited observation dataset. A broad zoonotic niche is predicted across 22 countries in Central and West Africa. Whilst several of these countries have reported index cases of EVD, others have not, although serological evidence in some regions points to possible underreporting of small-scale outbreaks (Kuhn, 2008). With improved ecological understanding, particularly with improvements to our knowledge of specific reservoir species and their distributions, it may be possible to delineate areas not at risk due to the absence of these species. 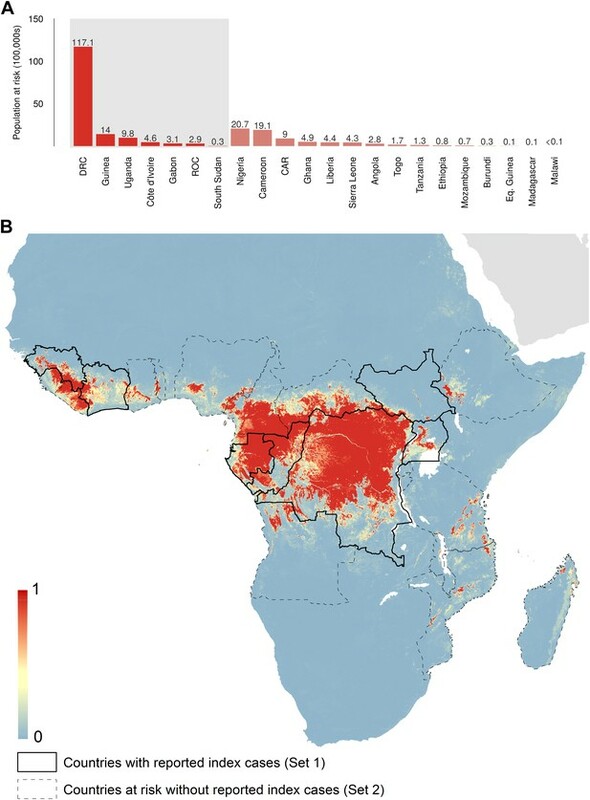 Despite relatively a large population living in areas of risk and the widespread practice of bushmeat hunting in these predicted areas (Wolfe et al., 2005; Mfunda and Røskaft, 2010; Brashares et al., 2011; Kamins et al., 2011), Ebolavirus is rare both in suspected animal reservoirs (Leroy et al., 2005; Olival and Hayman, 2014) and in terms of human outbreaks (Table 1). There is some indication however, that the frequency of Ebola outbreaks has increased since 2000, as shown in Figure 2A. 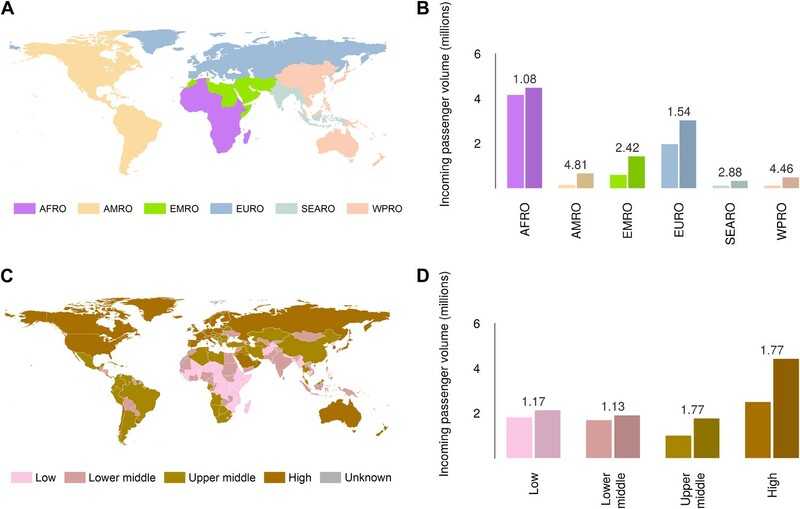 We have shown that the human population living within this niche is larger, more mobile and better internationally connected than when the pathogen was first observed. As a result, when spillover events do occur, the likelihood of continued spread amongst the human population is greater, particularly in areas with poor healthcare infrastructure (Briand et al., 2014; Fauci, 2014). Whilst rare in comparison to other high burden diseases prevalent in this region, such as malaria (Gething et al., 2011; Murray et al., 2012), Ebola outbreaks can have a considerable economic and political impact, and the subsequent destabilisation of basic health care provisioning in affected regions increases the toll of unrecorded morbidity and mortality of more common infectious diseases (Murray et al., 2014; Wang et al., 2014), throughout and after the epidemic period. The number of concurrent infections during the present outbreak represents a significant strain on healthcare systems that are already poorly provisioned (Briand et al., 2014; Chan, 2014; Fauci, 2014) and many other Set 1 and Set 2 countries rank amongst the lowest per capita healthcare spenders. These considerations should be paramount when international organizations debate the financing requirements for the improvement of healthcare needed in the region and the urgency with which new therapeutics and vaccines can be brought into production (Brady et al., 2014; Goodman, 2014). Together, these considerations necessitate prioritisation of efforts to reinforce and improve existing surveillance and control, and encourage the development of therapeutics and vaccines. The national population at risk estimates presented here would be a strong rationale for improving, prioritising and stratifying surveillance for EVD outbreaks and diagnostic capacity in these countries. We believe it would be prudent to test OWFB species in Set 2 countries for Ebola virus (Hayman et al., 2012), particularly during the bat breeding season to maximise chances of isolation in order to clarify the outbreak risk in these countries. In all Set 1 and Set 2 countries, raising awareness about the risk presented by reservoir bats and incidental primate hosts and the modes of transmission of this disease could be of value. Finally, increasing our capacity to rapidly map ever changing biological threats is also a core need (Hay et al., 2013b). The increasing connectedness of the Africa region means that EVD is now a problem of international concern. While most EVD secondary transmission occurs locally and is likely transported via ground transit (Francesconi et al., 2003), the potential for international spread of infection is possible, as demonstrated by the importation of the disease from Liberia to Nigeria, culminating in further secondary transmission in Lagos (WHO, 2014a). The aetiology of EVD infection and disease progression means that an international outbreak propagated by air travel remains unlikely, particularly in high-income countries better able to handle EVD cases (Fauci, 2014). Nevertheless, a non-negligible threat remains, particularly in the low and middle income destinations and the rapid increase in global connectivity of these at-risk regions indicates that international airports could see more imported cases (Chan, 2014). We have focussed on reanalysing the zoonotic niche for EVD transmission and the characterisation of the populations at risk to improve the landscape in which future risk and impact of EVD outbreaks can be discussed. During the current emergency much of the work will concentrate on routes of secondary transmission in the human population—conceptually the red arrow of the H box in Figure 1. An important task is to stratify the risk of EVD spread both within and between countries and identify the most likely pathways of spread for characterisation and surveillance. Our next priority therefore is to investigate aspects of secondary human-to-human transmission by documenting the rate of geographic spread of EVD during the past and ongoing epidemics to help understand changes in these patterns in the historical record. Simulating these movements in a real landscape of population movement patterns, inferred from population movements assessed by mobile phones and other data (Garcia et al., 2014), as well as parametric movement models (Simini et al., 2013) is a logical next step, and can be used in future targeting of interventions and potential new treatments for both the current and future outbreaks (Brady et al., 2014; Goodman, 2014). As previously discussed, whilst there is the risk of human travel during the latent phase of infection, and therefore potential for international spread, the high pathogenicity during infectiousness (immobilising infected persons) and the likely rapid and effective isolation measures implemented in regions with strong health care systems, limit the pandemic potential of EVD. Nevertheless, improvement of international containment plans and informed discussions of potential risks to airline carriers and populations of other regions will be supported by knowledge of local, regional and international population flows. Assessing these flows by air traffic volumes is an ongoing priority. There are several other zoonotic viral haemorrhagic fevers (for example Marburgvirus, Lassa fever, hantaviral infections and arenaviruses) that are of similar public health and biosecurity concern (Bannister, 2010), due to their high virulence and mortality and their potential to cause outbreaks and spread internationally. Despite this their geographical distributions are poorly understood (Hay et al., 2013a). Many of the methods applied here can be adapted to these diseases and improve our geographical understanding of the risk presented by these pathogens. We are in the midst of a public health emergency that will likely last for many more months (Chan, 2014) and which has brought EVD to global attention. We emphasise that the maps of zoonotic transmission presented here do not enable assessment of secondary transmission rates in human populations, but they do act as an evidenced-based indicator of locations with potential for future zoonotic transmission and thus outbreaks. Interestingly, early reports of another independent zoonotic outbreak in the DRC (MSF, 2014) are in predicted at-risk areas. An improved understanding of the spatial extent of the zoonotic niche can only help future efforts in biosurveillance. A boosted regression tree (BRT) modelling framework was used to generate predictive risk maps of the zoonotic Ebola virus niche in Africa. This methodology combines regression trees, where trees are built according to optimal decision rules based on how binary decisions best accommodate a given dataset (De'ath, 2007; Elith et al., 2008), and boosting, which selects the tree that minimises the loss function. In doing so, a parameter space is defined which captures the greatest amount of variation present in the dataset. In order to train the model, four component datasets were compiled: (i) a comprehensive dataset of the reported locations of Ebola virus transmission from a zoonotic reservoir to a human; (ii) a dataset of the locations of Ebola virus infections in suspected reservoir and (non-human) susceptible host species (iii) a suite of ecologically relevant environmental covariates for Africa, including predicted distribution maps of suspected reservoir bat species and (iv) background (or pseudo-absence) records representing locations where zoonotic Ebola virus has not been reported. This study was limited to the African continent since no natural outbreaks of EVD have occurred outside the continent (CDC, 2014). Only Reston ebolavirus has a distribution reported outside of Africa, focussed in the Philippines, but has never been reported as pathogenic in humans; as a result this species was not included in the analysis. Tables detailing proven outbreaks of Ebola virus, initially sourced from the scientific literature (Kuhn, 2008) and from health reporting organisations (CDC, 2014), were used to coordinate searches of the formal scientific literature using Web of Science and PubMed for each specific outbreak. Relevant papers were abstracted and where possible outbreak-specific epidemiological surveys were sourced. The citations in these references were obtained in order to reconstruct the outbreak in detail and to identify the most probable index case. Index cases were defined as any human infection resulting from interaction with non-human sources of the disease. Some of these cases arose from presumed interactions with zoonotic reservoirs or hosts, such as primates and other mammals during hunting trips (Boumandouki et al., 2005; Nkoghe et al., 2005, 2011; WHO, 2003) or butchering of bats (Leroy et al., 2009). Any cases arising from existing human infections are considered as secondary infections rather than index cases. Similar to methodology employed elsewhere (Messina et al., 2014), the site, or supposed site, of this zoonotic transmission event was geopositioned using Google Earth. For locations where precise geographic information (e.g., geographic coordinates of a hunting camp) was provided by the authors, these were used. Where precise geographic information could not be accurately geopositioned, a geographic area (termed a polygon) was defined covering the reported region. In several cases only the first reported patient could be identified, with the source of infection unknown. With these outbreaks the location of the first patient was geopositioned under the assumption that an initial zoonotic spillover event occurred in the vicinity of this location. 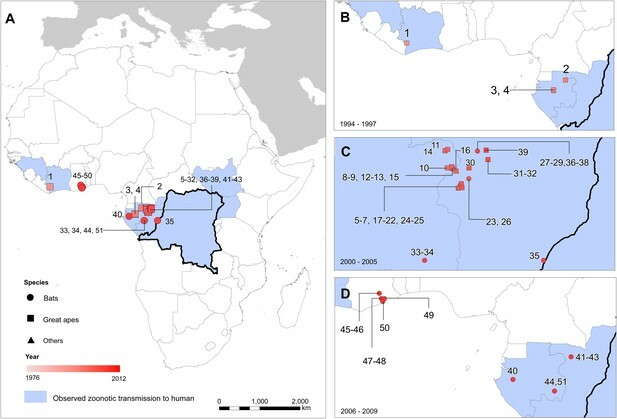 In two outbreaks multiple independent zoonotic transmission events were identified (WHO, 2003; Nkoghe et al., 2005; Pourrut et al., 2005), and each unique event was geopositioned and included in the model as separate entities. Table 1 catalogues the outbreaks used in this study. A literature search was conducted in Web of Science using the search term “Ebola” that returned 8635 citations. The abstracts were examined and for those that contained possible data on animal Ebola infection, the full text was obtained. The sampling site or location of the animal in the study was identified and geopositioned using Google Maps. These locations were recorded either as precise locations or as polygons, as with human index cases. Records for which local transmission of Ebola virus was deemed unlikely (e.g., seropositive primates tested in containment facilities several years after their capture) were excluded from the study. The non-human Ebola virus occurrence data collected are detailed in Table 2, including the diagnostic methods used. The open access sequence database GenBank (NCBI, 2014) was searched using MESH Umbrella search terms for Ebola virus, returning 181 results. These were then manually cross-referenced with the existing human and animal Ebola information, collected above, and 30 duplicates were removed. For the remaining isolates, original references and GenBank information fields were examined, but as there was insufficient information to establish precise location of isolation and/or whether the isolate represented an index case for any of these data sources, they were excluded from subsequent analyses. A suite of ecologically relevant gridded environmental covariates for Africa was compiled, each having a nominal resolution of 5 km × 5 km. The environmental covariates used in this analysis were: elevation (from the shuttle radar topography mission [ORNL DAAC, 2000]); the mean value, and a measure of spatial variation (range, described below) between 2000 and 2012 of Enhanced Vegetation Index (EVI), daytime Land Surface Temperature (LST) and night-time LST; and mean potential evapotranspiration from 1950–2000 (Trabucco and Zomer, 2009) (Figure 5—figure supplement 1). The EVI and LST datasets were derived from satellite imagery collected by NASA's Moderate Resolution Imaging Spectroradiometer (MODIS) remote sensing platform (Tatem et al., 2004). EVI is a metric designed to characterise vegetation density and vigour based on the ratio of absorbed photosynthetically active radiation to near infrared radiation (Huete et al., 2002). LST is a modelled product derived from emissivity as measured by the MODIS thermal sensor (Wan and Li, 1997), which is correlated, though not synonymous with air temperature, and effective for differentiating landscapes based on a combination of thermal energy and properties of surface types. The MODIS datasets utilized in this research (EVI was derived from the MCD43B4 product and the MOD11A2 LST product was used directly) were acquired as composite datasets created using imagery collected over multiple days, a procedure that results in products with 8-day temporal resolutions. Despite compositing, the EVI and LST datasets contained gaps due to persistent cloud cover found in forested equatorial regions, and these gaps were filled using a previously described approach (Weiss et al., 2014a). The EVI and LST datasets were then aggregated from their native 1 km × 1 km spatial resolution to a final 5 km × 5 km resolution, calculating both the mean and the range of the values of the subpixels making up each larger pixel. These spatial summaries therefore characterise both the mean temperature in each location as well as the degree of spatial heterogeneity within that pixel. This is of interest as humans and susceptible species are more likely to come into contact in transitional areas (e.g., boundary areas between areas of highly suitable susceptible species habitat and areas heavily utilised by humans). The final covariate production step consisted of summarising temporally across the 13-year data archive to produce synoptic datasets devoid of annual or seasonal anomalies (Weiss et al., 2014a). Over recent years, significant research has been undertaken in investigating the role bats have to play in the transmission cycle of Ebola viruses (Olival and Hayman, 2014) and evidence of asymptomatic infection in fruit bats has been documented to varying extents (Leroy et al., 2005; Pourrut et al., 2007, 2009; Hayman et al., 2010; Hayman et al., 2012). In order to incorporate this potential driver of Ebola virus transmission into the model we developed predicted distribution maps for three species of fruit bat implicated as primary reservoirs of the disease: Hypsignathus monstrosus, Epomops franqueti and Myonycteris torquata. The evidence was strongest for these three species having a reservoir role as Ebola virus RNA (all nested within the Zaire ebolavirus phylogeny [Leroy et al., 2005]) has been detected in all three. Whilst a handful of other bat species have been found to be seropositive, no further viral isolations have been recorded (Olival and Hayman, 2014). Whilst expert opinion range maps for these species exist (Schipper et al., 2008), there is some disagreement with independently-sourced occurrence data (all archived in the Global Biodiversity Information Facility). As a result, a predictive modelling approach was used to create a continuous surface of habitat suitability for these species which we then included as a predictor in the model. Occurrence data for all Megachiroptera in Africa was extracted from GBIF (GBIF, 2014) using the R packages dismo (Hijmans et al., 2014) and taxize (Chamberlain et al., 2014). To remove apparently erroneous records in the GBIF archive all occurrence records more than 100 km from the species known ranges, as determined by expert-opinion range maps (Schipper et al., 2008), were excluded, as were duplicate records and those located in the ocean. This resulted in a total dataset of 1341 unique occurrence records. The occurrence database was then used to train separate boosted regression tree species distribution models (Elith et al., 2008) to predict the likely distribution of each of these suspected reservoir species. For each model, occurrence records for the target species (H. monstrosus, n = 67; E. franqueti, n = 120; and M. torquata, n = 52) were considered presence records and occurrence records of all other species were used as background records. This procedure is designed to account for the potentially biasing effect of spatial variation in recording of Megachiroptera occurrences (Phillips et al., 2009). For each species we ran fifty submodels each trained to a randomly selected bootstrap of this dataset, subject to the constraint that each bootstrap contained a minimum of 10 occurrence and 10 background records. 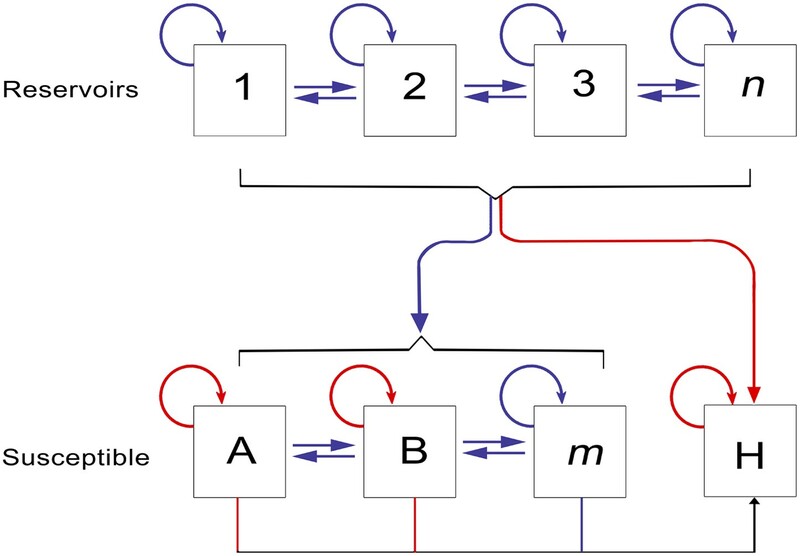 Each submodel was fitted using the gbm.step subroutine (Elith et al., 2008) in the dismo R package. In each submodel the background records were down weighted so that the weighted sum of presence records equalled the weighted sum of background records (Barbet-Massin et al., 2012) in order to maximise the discrimination capacity of the model. We generated a prediction map from each of these submodels and calculated both the mean prediction and 95% confidence interval around the prediction for each 5 km × 5 km pixel for each species. Model accuracy was assessed by calculating the mean area under the curve (AUC) statistic for each submodel under a stringent 10-fold cross validation for each submodel and obtaining the mean and standard deviation across all 50 submodels. Under this procedure the dataset was split into ten subsets, each containing approximately equal numbers of presence and background points. The ability of a model trained on each subset to predict the distribution of the other 90% of records was assessed by AUC and the mean value taken. As so few presence records were used to train each fold model (i.e., around 5 presence records for M. torquata up to 12 for E. franqueti), this represents a very stringent test of the model's predictive capacity. Additionally, to prevent inflation of the accuracy statistics due to spatial sorting bias, these statistics were estimated using a pairwise distance sampling procedure (Hijmans, 2012). Consequently, the AUC statistics presented here are lower than would be returned by standard procedures but gives a more realistic quantification of the model's ability to extrapolate predictions to new regions (Wenger and Olden, 2012). We also generated marginal effect plots with associated uncertainty intervals and relative contribution statistics (how often each covariate was selected during the model fitting process) as quantification of the sensitivity of the model to the different covariates. These allow us to make inferences about the ecological relationship between each species and its environment as well as to identify where this relationship is most uncertain. To generate a single surface describing the distribution of the bat reservoir species to be used as a covariate in the subsequent Ebola modelling, the three mean prediction distribution maps were merged by taking the average habitat suitability for each of the three bat species at each pixel. The Ebola virus occurrence dataset was supplemented with a background record dataset generated by randomly sampling 10,000 locations across Africa, biased towards more populous areas as a proxy for reporting bias (Phillips et al., 2009). We fitted 500 submodels to bootstraps of this dataset. To account for uncertainty in the geographic location of those occurrences reported as polygons, for each submodel one point was randomly selected from each of these occurrence polygons. This Monte Carlo procedure enabled the model to efficiently integrate over the environmental uncertainty associated with imprecise geographic data. A bootstrap sample was then taken from each of these datasets and used to train the BRT model using the same procedure and weighting of background records as for the bat distribution models. Similarly, we generated a prediction map from each of these models and calculated both the mean prediction and corresponding 95% confidence intervals for each pixel and analysed prediction accuracy using the same stringent cross validation and sensitivity analysis procedure as for the bat distribution models (detailed above). The predicted distribution map produced by this approach represents the environmental suitability of each pixel for zoonotic Ebola virus transmission. This may be interpreted as a relative probability of presence in the sense that more suitable pixels are more likely to contain zoonotic transmission than less suitable pixels, though not an absolute probability that transmission occurs in a given pixel. Similarly, the presence of zoonotic transmission increases the risk of transmission to a human, though this is also contingent on how humans interact with these zoonotic pools, through hunting or other activities. In order to identify areas which are likely to be at risk of transmission of Ebolavirus from zoonotic reservoir hosts to humans, the continuous map of the predicted environmental suitability for zoonotic transmission (shown in Figure 5) was converted into a binary map classifying pixels as either at risk or not at risk. A pixel was assumed to be at risk if its predicted environmental suitability for zoonotic Ebola virus transmission was greater than 0.673, the lowest suitability value predicted at the locations of known transmission to humans (point records of human index cases). Countries containing at least one at-risk pixel are shown in Figure 5B—those countries that previously report an index case were defined as Set 1; countries with at least one at-risk pixel with no previous index cases of EVD were categorised as Set 2. The number of people living in at-risk areas in each of these countries was calculated by summing the estimated population of at-risk pixels using population density maps from the AfriPop project (Linard et al., 2012; WorldPop, 2014) and the proportion of those living in urban, periurban and rural areas was evaluated using the Global Rural Urban Mapping Project (CIESIN/IFPRI/WB/CIAT, 2007). The R code used for all of the analysis has been made available on an open source basis (https://github.com/SEEG-Oxford/ebola_zoonotic). For three separate years (1976, 2000 and 2014), total national populations were retrieved and the proportion of rural to urban populations noted from World Bank statistics (World Bank, 2014). To describe global air travel patterns from Set 1 and Set 2 countries, flight schedules data from the Official Airline Guide, reflecting an estimated 95% of all commercial flights worldwide, were analysed between 2000 and 2013 to calculate the annual volume of seats on direct flights that depart from each predicted country and which have an international destination. Complementing these seat capacity data, worldwide data on anonymised, individual passenger flight itineraries from the International Air Transport Association (2012) (IATA, 2014) were analysed between 2005 and 2012 to calculate the annual volume of international passenger departures out of each Set 1 and Set 2 country. The IATA dataset represents an estimated 93% of the world's commercial air traffic at the passenger level and includes points of departure and arrival and final destination information for travellers as well as their connecting flights. The New England Journal of Medicine, 10.1056/NEJMoa1404505. Selecting pseudo-absences for species distribution models: how, where and how many? Methods in Ecology and Evolution 3:327–338. Bulletin of the World Health Organization 61:997–1003. PLOS Neglected Tropical Diseases 8:e3056. Bulletin de la Société de Pathologie Exotique 98:218–223. Proceedings of the National Academy of Sciences of USA 108:13931–13936. The New England Journal of Medicine, 10.1056/NEJMp1409858. Accessed: August 2014. Available: http://www.cdc.gov/vhf/ebola/resources/outbreak-table.html. R package, Accessed: August 2014. Available: https://github.com/ropensci/taxize. The New England Journal of Medicine, online, 10.1056/NEJMp1409859. Journal of Theoretical Biology 229:119–126. Accessed: December 2013. Available: http://sedac.ciesin.columbia.edu/gpw. The American Journal of Tropical Medicine and Hygiene 27:1210–1215. PLOS Currents, 6, ecurrents.outbreaks.84eefe85ce43ec89dc80bf0670f0677b0678b0417d, 10.1371/currents.outbreaks.84eefe5ce43ec9dc0bf0670f7b8b417d. Annual Review of Ecology, Evolution, and Systematics 40:677–697. The Journal of Animal Ecology 77:802–813. The New England Journal of Medicine, 10.1056/NEJMp1409494. The Journal of Infectious Diseases 179:S120–S126. Accessed: August 2014. Available: http://www.gbif.org/. The Journal of Infectious Diseases 179:S65–S75. The Journal of Infectious Diseases 204:S776–S784. Philosophical Transactions of the Royal Society of London. Series B, Biological Sciences 368:20120250. Bulletin de la Société de Pathologie Exotique 98:230–236. The Journal of Infectious Diseases 142:372–376. Accessed: August 2014. Available: http://cran.r-project.org/web/packages/dismo/dismo.pdf. Remote Sensing of Environment 83:195–213. Proceedings of the National Academy of Sciences of USA 101:15124–15129. Accessed: August 2014. Available: http://www.iata.org/Pages/default.aspx. Bulletin of the World Health Organization 56:271–293. The Journal of Infectious Diseases 179:S76–S86. AMQ King, MJ Adams, EB Carstens, E Lefkowitz, editors. London: Elsevier. Transactions of the Royal Society of Tropical Medicine and Hygiene 101:64–78. International Journal of Infectious Diseases 8:27–37. The Lancet Infectious Diseases 3:255. Vector Borne and Zoonotic Diseases 9:723–728. International Journal of Biodiversity and Conservation 2:263–272. Bulletin de la Société de Pathologie Exotique 97:199–205. Accessed: August 2014. Available: http://www.msf.org/article/ebola-epidemic-confirmed-democratic-republic-congo-msf-sends-specialists-and-material. Accessed: August 2014. Available: http://www.ncbi.nlm.nih.gov/genbank/. Bulletin de la Société de Pathologie Exotique 98:224–229. Transactions of the Royal Society of Tropical Medicine and Hygiene 105:466–472. Tropical Medicine & International Health 7:1068–1075. The Journal of Infectious Diseases 196:S193–S198. Accessed: August 2014. Available: http://webmap.ornl.gov/wcsdown/wcsdown.jsp?dg_id=10008_1. The Journal of Infectious Diseases 196:S176–S183. Proceedings of the National Academy of Sciences of USA 109:16083–16088. International Journal of Geographical Information Science 13:143–158. PLOS Neglected Tropical Diseases 3:e481. International Journal of Applied Earth Observation and Geoinformation 6:33–46. Transactions of the Royal Society of Tropical Medicine and Hygiene 87:162–162. Accessed: August 2014. Available: http://www.csi.cgiar.org. In: MA Huffman, CA Chapman, editors. Primate parasite ecology: the dynamics and study of host-parasite relationships. Cambridge: Cambridge University Press. pp. 183–197. IEEE Transactions on Geoscience and Remote Sensing 35:980–996. ISPRS Journal of Photogrammetry and Remote Sensing, accepted manuscript. Methods in Ecology and Evolution 3:260–267. Accessed: August 2014. Available: http://www.who.int/csr/don/2012_07_29/en/. Accessed: August 2014. Available: http://www.who.int/csr/don/2012_08_18/en/. Accessed: August 2014. Available: http://www.who.int/csr/don/2012_11_17/en/. Accessed: August 2014. Available: http://www.who.int/csr/don/2014_08_15_ebola/en/. Accessed: August 2014. Available: http://www.who.int/healthinfo/global_burden_disease/definition_regions/en/. Accessed: August 2014. Available: http://www.who.int/mediacentre/news/statements/2014/ebola-20140808/en/. Bulletin of the World Health Organization 56:247–270. Proceedings of the National Academy of Sciences of USA 104:17123–17127. Accessed: July 2014. Available: http://data.worldbank.org/. Accessed: August 2014. Available: http://www.worldpop.org.uk/. Accessed: August 2014. Available: http://wwf.panda.org/about_our_earth/ecoregions/ecoregion_list/. Journal of the Royal Society, Interface 5:759–772. Thank you for sending your work entitled “Mapping the zoonotic niche of Ebola virus disease in Africa” for consideration at eLife. Your article has been favorably evaluated by Prabhat Jha (Senior editor), who is overseeing the peer review of your article, three members of our Board of Reviewing Editors, and we have also received comments from five experts from outside of the Board of Reviewing Editors. Two of the reviewers, Pasi Penttinen and Alimuddin Zumla, have agreed to reveal their identity. The Senior editor has assembled the following comments to help you prepare a revised submission. We request the specific important revisions to ensure high scientific integrity of a very visible, and topical subject, given the on-going attention to Ebola virus. 2) The 22 million people at risk needs important caveats as most of these live in cities/towns and are at risk of secondary spread. We would like to see more analysis/discussion of secondary spread potential versus primary fruit bat exposure risk, which is the basis for the 22M. 3) The discussion of air travel-based risk seems incomplete: the risk of air travel-related transmission between Set 1 and Set 2 countries is not provided, but would appear to be crucial. 4) Similarly, one reviewer points out a possible role of rivers in disrupting primate transmission of other viruses. Are there similar geographic variables to account for EBV variation in risk? 5) There is not sensitivity analyses in the Methods section to outline to which of the variables the final risk estimates were most sensitive. If possible, some uncertainty estimates on the population at risk rather than a single point estimate would be helpful. 6) Similarly, the Discussion requires a clear discussion about the limitations of the methods (pointed out by reviewer 3 in particular, but other reviewers also). 7) The Abstract needs to provide greater detail about exposure risk versus secondary transmission risk. 8) The health system data/spending has recently been covered also in the NEJM. You might consider dropping this as it is not central to the argument, and it is already well known that health spending and capacities are low in the EBB-affected regions. These recent papers should be cited, however. We encourage your team to carefully examine all the language in the Discussion and in the Abstract in particular to be as cautious as possible. We recognize urgency of the paper, and the difficulties working with limited data, but this places special emphasis on very cautious interpretation. All the review comments now follow. Please pay particular attention to the key comments in italics. This is a subject of global importance. Pigott et al have written an excellent, clear, and comprehensive review putting together all available and latest data on EVD on recorded zoonotic transmission to humans, other primates and bats and have coupled this other environmental information to model the zoonotic niche of EVD in Africa which has then been mapped. 2) A brief mention of the effects of potential effects of EVD on the distribution of non-human primates. Inogwabini BI1, Leader-Williams N. Effects of epidemic diseases on the distribution of bonobos. PLOS ONE. 2012;7(12):e51112. doi: 10.1371/journal.pone.0051112: This study examined how outbreaks and the occurrence of Anthrax, Ebola, Monkeypox and Trypanosomiasis may differentially affect the distribution of bonobos (Pan paniscus). Using a combination of mapping, Jaccard overlapping coefficients and binary regressions, the study determined how each disease correlated with the extent of occurrence of, and the areas occupied by, bonobos. Ebola, Monkeypox and Trypanosomiasis were each reported within the area of occupancy of bonobos. Their results suggest that large rivers may have prevented Ebola from spreading into the range of bonobos. This is a highly topical and ambitious study improving previously published predictions of environmental suitability of Ebola virus disease transmission to humans. It has been designed, analysed and written up by an experienced group of epidemiologists, modellers, and public health professionals. There is a public health need to get such analyses published rapidly to aid the ongoing, unprecedented outbreak response in Western Africa. The paper is analysed, presented, and written clearly, and the conclusions are sound and based on the results of the analyses. 1) I do not understand how the information on travel patterns falls in the scope of this paper. If the travel patterns between countries potentially at risk were used in the models, please clarify in methods descriptions. If they were not used, I suggest considering leaving this only in discussion, or perhaps developing a follow-up manuscript of the international risks. The same comment applies to the comparison of the health systems strengths. 2) I struggle to understand the relationship with the animal distribution and the other environmental factors in the models. Should one not consider the presence of a suspected vector as an “obligatory” factor necessary for transmission, while the other factors are “enabling” or “facilitating” factors, therefore the risk zones should include only zones with potential or confirmed host animal presence. It is not immediately obvious from the maps or the discussion. Please clarify in the Discussion. 1) As someone involved in both the research and operational aspects of medical intervention in West Africa, I find nothing at all new about what is stated in this paper. In essence, what the authors are remarking is that population growth (and demographic changes), mobility, and poor public health infrastructure are risk factors for EVD. The new (ish) component of this paper is that they have done a good job of synthesizing diverse datasets into a clear and understandable way to present this information for a general scientific audience. 2) The language in the conclusion, as mentioned, needs to be toned way down. Although I appreciate and understand the need to have a way forward with respect to research, for those of us involved in the response to this epidemic, clearly, everyone recognizes the need to strengthen surveillance in the region, and the authors need to be careful in terms of how the conclusion is framed so as not to imply that this is somehow not recognized. I would strongly suggest that they take another stab at the conclusion and also make reference to several of the very nice perspective pieces in the NEJM that have been ongoing. 3) It is interesting that the authors do not make great use of the environmental aspects. Perhaps I misread this part in the paper, but it would be important to emphasize that increasing contact with potential reservoirs (whether due to poverty, culture or deforestation) plays a role. The component on reservoir mapping and the vegetation index I believe touches on this, but perhaps I missed this aspect. This is also arguably the case with respect to food insecurity. For example, in Guinea, one of the major difficulties in implementing public awareness measures to prevent hunting and eating of bushmeat is the need to replace bushmeat with some other food! The authors, unless they did and I missed it, would do well to discuss the interaction of diverse sectors in terms of the health care infrastructure. The authors are an experienced modelling group who have developed a novel approach to modelling risk. The model uses multiple data feeds to model the risk of zoonotic infection with Ebola virus infection (EBV) and by extension the risk to people. The model uses animal infection climactic, topographical, airline travel, and human population growth to predict geographic areas at risk of EBV. The contribution is novel and valuable. It theoretically expands the number of countries at risk from those in which it has occurred to 22 where conditions are favourable for its occurrence. It would have been interesting to retroactively apply the model to past human outbreaks. The paper is very well written, very topical, and the work important. Moreover there may be applicability to other viral hemorrhagic fevers and perhaps other zoonotic disease. The approach seems relevant and is (to me) original. The authors have a good understanding of all the uncertainties that are involved, as well as of the historical and historical context in which the epidemics take place, in their estimates and the manuscript is well written. If I were an editor at eLife I would go for it. (i) It needs a technical appendix to explain exactly how the various models were constructed. (ii) This is really pushing the data as far as it can go, which is okay since it is all the data we have – but the limitations of this exercise are not really discussed thoroughly. A paper on the Ebola epidemic is current and warrants fast tracking. However this manuscript is not addressing the key challenges and issues adequately, and unless authors can address this I don't think the manuscript in its current form is acceptable. The important issues relate to risk, the ethics relating to experimental drugs, and containment efforts. The Ebola emergency clearly warrants urgent attention. Geospatial risk modeling provides potentially valuable information, and this report is timely. For public health planning we need to consider secondary spread particularly and this needs more development in the argument. 1) Reads more like a review, albeit a good one. 2) Suggest paper focuses specifically on Ebola risk. Some of the more peripheral arguments can be condensed. 3) Needs clearer explanation of the limitations: specifically assumes equivalent fruit bat susceptibility and virus transmissibility. Bat to human transmission is relatively rare after all, yet the bats and the humans are both numerous. 4) 22 million people may live in the potentially affected regions but most of them are in cities/towns and are at risk of secondary spread. I would like to see more analysis/discussion of secondary spread potential versus primary fruit bat exposure risk. 5) It would be useful to identify key assumptions in the modeling to which the predictions are sensitive yet uncertainty is high as immediate research priorities. Many interesting points were raised and we hope that any concerns have been suitably addressed in this revision. There have been early reports of another outbreak of Ebola virus disease in the Democratic Republic of Congo apparently arising from an independent zoonotic transmission event. At this time there is insufficient information to include this new outbreak in the model as precise information for the index case has not been reported, however we make reference to this in the conclusion and highlight that the locations of reported cases are within an area predicted to be at risk of zoonotic transmission. Consequently, addition of this data point would be unlikely to affect the current model predictions. We thank the reviewer for the positive feedback. We have incorporated this reference, as well as the other NEJM articles that were published subsequent to our initial submission. As a result, we have also dropped Figure 9 and its accompanying text in the article. This research is primarily focused on the impact of zoonotic transmission to humans, and the environmental data and occurrences from animal populations were used to supplement our understanding of this distribution. The nature of human and bonobo disease interaction is unclear, and we only included in the modelling framework the three bat species for which the evidence for being reservoir species is greatest. Gorillas and chimpanzees are suspected dead-end hosts, and therefore these animals were not considered in the same manner. Since bats are not restricted by physical landmarks in the same way as primates, we did not include this aspect in our analysis. It is hoped that our work in addressing zoonotic transmission risk will aid future research by others into primate risk. We thank the reviewer for the generally positive reaction to the paper. Analysis of population growth, travel patterns and healthcare expenditure was presented to provide evidence of the change in demographic and socioeconomic circumstances of populations living within areas suitable for zoonotic Ebola virus transmission and provide a quantitative summary of factors related to disease emergence, previously only qualitatively discussed. It is not provisioned to provide specific information on the current epidemic but to help wider thinking of the changing likelihood of secondary transmission of any initial zoonotic transmission event. To address this concern, echoed by the editor, we have significantly trimmed down the respective sections, removing Figure 9 and the section on healthcare expenditure, and condensing the international air travel from three paragraphs to one. We also cite the recent perspective pieces from the NEJM as requested. We thank the reviewer for the critique, but we respectfully disagree. One key improvement is the updated risk map incorporating not just the more recent human outbreaks over previous publications, but also expanding the consideration of the niche of EVD to include infections across the Ebola transmission cycle. In addition, we have provided an evidence base for the changing demographic and socioeconomic situations in both Set 1 and Set 2 countries and indicate that in the future there is an increased likelihood of secondary transmission (in the absence of intervention) from any primary zoonotic transmission event. We are unaware of a previous quantitative assessment of these changes and therefore believe this to be a novel contribution. We have however reduced the prominence of these sections, particularly in the Discussion and Abstract in response to the review comments and editorial guidance. We ask during the resubmission evaluation, if these adjustments have not been sufficient and there is still concern, that the editors highlight specific sentences. We thank the reviewer for their comments. Our primary goal here was to map the zoonotic niche by using data from all outbreaks. We have already provided some of the analysis requested by the reviewer, in particular running a model iteration with the most recent outbreak excluded. The model trained using index cases before 2013 predicted risk within Guinea and very close to the reported index case for the 2013 outbreak. Similarly, all previous index cases occur within or near to areas of predicted highest risk. We highlight the section specific to Guinea and have added statements to clarify. We thank the reviewer for their endorsement. We have followed previous feedback from our last submission to eLife to provide a summary of the methods within the manuscript rather than a technical appendix. We therefore reference previous work, including “A working guide to Boosted Regression Trees” (outlining the core methodology) and disease-specific applications of this approach (for dengue, leishmaniasis and malaria vectors). We have now also uploaded the source code for this analysis to Github and provided a link to this in the paper. If directed to do so by the editors, we can provide more details on specific sections of the paper. We agree with the reviewer that all these features are important, but have to respectfully disagree that the issues raised are important within the context of this work. We explain throughout the article that this work concerns primary transmission events and not secondary outbreaks, and therefore experimental drugs and containment efforts are not immediately relevant. In order to better clarify this distinction, we have amended the text in the discussion and incorporated references to drug development within the text, tying this to secondary transmission modelling. We agree with the reviewer that modelling secondary spread is important, and it is currently the focus of further work. We believe that it is important to refine our understanding of the risk of zoonotic transmission and believe we have outlined this clearly and consistently throughout the manuscript, and not made any claims about direct spread modelling. Anything concerning secondary transmission is in relation to the changing nature of humans living in areas at-risk, but not directly related to the potential magnitude of a specific outbreak. We have strengthened various parts of the manuscript to reflect the differences in approach that primary transmission and secondary transmission necessitate as detailed in the response to Reviewer 7. In response to this and editorial guidance, we have dropped Figure 9 and its related content and cited the recent NEJM articles as requested by other reviewers in its place. We have decided to keep the brief descriptions of growth and travel volumes as this adds a quantitative analysis of features that have only so far been considered qualitatively, but these sections have been trimmed down in size, particularly in the discussion. (in the Methods) “The number of people living in at-risk areas in each of these countries was calculated by summing the estimated population of at-risk pixels using population density maps from the AfriPop project (Linard et al., 2012; WorldPop, 2014) and the proportion of those living in urban, periurban and rural areas was evaluated using the Global Rural Urban Mapping Project (CIESIN/IFPRI/WB/CIAT, 2007). Our methods section was unclear that the marginal effects plots and relative contributions represent uncertainty and covariate sensitivity in our model. We have edited text in the Methods and figure legend for Figure 5–figure supplement 2 to reflect this. As outlined in various responses above, we have streamlined a number of sections, specifically those relating to healthcare expenditure and the discussion about international travel. We have however included the corresponding results paragraphs, as this form part of the key narrative that the changing populations living at risk have the potential to influence the dynamics of future outbreaks. The majority of these populations are rural. Please see comments for Reviewer 8. The context for air travel risk was for a potential future outbreak (i.e., an index case in either Set 1 or Set 2 which then subsequently spread from human-to-human to another location, including another Set 1 or 2 country), hence the global summary statistics for air travel. However, we have reduced the prominence of this section within the discussion considerably. Please see comments for Reviewer 1. Please see comments for Reviewers 6, 7 and 8 – we have clarified how such estimates can be inferred from our model. It was not possible to calculate uncertainty for the population at risk estimates. Please see comments for Reviewer 3. We have amended the abstract to be more focussed on primary zoonotic transmission. We have dropped this section and have included references to the recent NEJM articles throughout. We thank Katherine Battle, Maria Devine and Kirsten Duda for proof-reading and Jane Messina for creating Figure 1. We also thank Andrew Rambaut for his comments on the final draft. © 2014, Pigott et al. David M Pigott et al. Identifying the regions where wild animal populations could transmit the Ebola virus should help with efforts to prepare at-risk areas for future outbreaks.